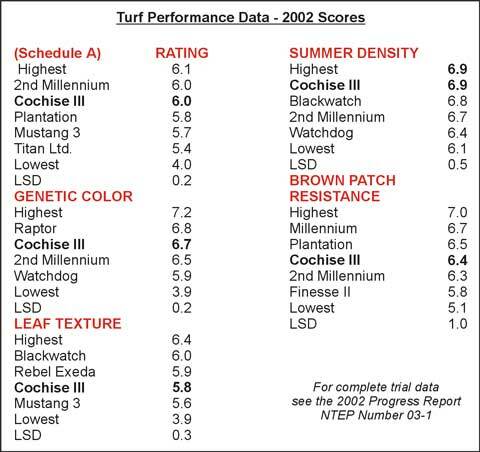 Cochise III rates equivalent to the top variety in overall turf quality in the 2002 NTEP report (Schedule A). It was selected out of Rutgers University based on its dark, open turf, and disease resistance. Cochise III has an endophyte level of 88%, which makes it a very persistent and tolerant tall fescue even under stress. Its high traffic tolerance makes it an excellent choice of sports fields and other high traffic areas. Look for yourself and you will see Cochise III is one of the BEST tall fescues available today.